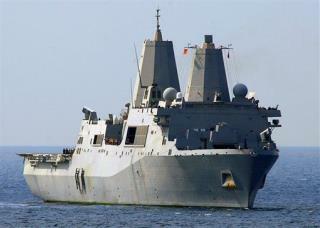 (Newser) – A Libyan terrorist suspect who had been detained aboard a US warship is now in the United States, anonymous officials tell the AP. US special operations forces snatched Abu Anas al-Libi (aka Nazih Abdul-Hamed al-Ruqai) during a raid in Libya on Oct. 5. He was held for questioning aboard the USS San Antonio in international waters, in what some observers saw as an alternative to the CIA's old "black sites" model. I don't agree with the US Courts trying terrorists. They didn't steal a pack of smokes or knock over a liquor store. They KILLED us. They are not American citizens and they do not subscribe to our Constitution. He was not caught on our soil. They are at war with us. Any means possible to gain what knowledge they have should be utilized and then tried in a military tribunal. If this is not acceptable they can visit Bin-Laden in the swimming hole. That is the way this country became great. We remain the pillar of light for freedom but don't screw with us. This is the method we became respected by our friends and feared by our enemies for over 2 centuries. The U military captured him! Let the courts try him! Tough actions! Not tough talk! We will hunt them down one by one and bring them to justice. They will never kill our people again, they did attack us first and we will take care of them sooner or later but we will.